We can modify our agricultural practices to sequester carbon in the soil. If this becomes the global paradigm, we can actually have enough of a mitigating effect on global CO2 to reduce it in the relatively near term, basically right away, if at least 50% of global food production happens this way. It's being done. It's not rocket science. Buffalo used to do it and they were not Einstein. Capital, as defined in current economic terms, does not include the fundamental life-sustaining ecosystems, within which economy grows,. "Economy" consumes life as free and valueless until it is producing cash-flow. It's been a good run. Now that paradigm approaches the point where we all die. "At every level, the life capital bases of society are invaded by private money-sequence demands adding costs and degrading them so that most are in cumulative decline. This is the macro pattern of life capital dispossession and common wealth destruction by the transnational money-sequence system until a public life capital turn steers us." Russia announces policy to be completely food self-sufficient by 2020, and with high quality organic agriculture, which has become the norm in the past 15 years. Russian agriculture has recovered from Stalin (finally). Thanks Tom. 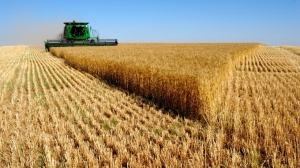 Russia is projected to be the world's largest wheat exporter this year. Troika demands that Greeks prepare "contingency plans" for further austerity, to be enacted without recourse, if/when Greece fails to meet impossible commitments made last year, under duress. "It's not legal", say Greek officials. "Oh, we'll find a way for it to be legal", comes the reply. On January 19, 2008, Obama said, "The Armenian Genocide is not an allegation, a personal opinion, or a point of view, but rather a widely documented fact supported by an overwhelming body of historical evidence. The facts are undeniable. An official policy that calls on diplomats to distort historical facts is an untenable policy." German thought police arrest Pirate Party leader for reciting anti-Erdogan poem at free-speech rally, and send everybody home. Thanks Tom. There is online betting available on the question of whether the 147 FBI investigators on the case of the illegal Clinton email server will succeed in getting an indictment for Mrs Clinton in 2016 Current odds are down to around 17%. The "Justice" Department seems to be resisting it for some reason. Rumors that the FBI investigators may leak information are resurgent.